BATEAU: This neckline curves downward slightly below the collarbone to the edge of the shoulders. HALTER: This neckline has a collar that wraps around the neck, usually with a low-cut back. ILLUSION YOKE: This neckline features a transparent fabric, lace or netting, that is fitted at the neckline and extends to the bust line. JEWEL: Like a t-shirt, the Jewel neckline is a high, rounded neckline usually falling above the color bone. OFF-THE-SHOULDER: As the name suggests, this neckline frames the face, neck and shoulders by falling just below the shoulders and across the bustling. PORTRAIT: An off-the-shoulder style, this neckline folds around the shoulders, like a fitted and structured shawl. QUEEN ANNE: This style has a heart-shaped neckline in the front combined with a collar-like back, similar to the style worn during the reign of Queen Anne in 18th Century England. SABRINA: Similar to a bateau neckline, the Sabrina style begins two inches in from each shoulder and curves gently downward below the collarbone. SCOOP: This neckline is low and rounded with a “U” shape. SPAGHETTI STRAPS: This neckline has thin straps and can be straight across or shaped. SQUARE/COURT: This neckline is low, like the scoop neckline, but with a squared shape. STRAPLESS: This neckline has no straps and can be straight across or shaped. SWEETHEART: This neckline dips to a heart shape at the bust line. V-NECK: This neckline dips to a “V” in the center. WEDDING BAND: This neckline features a band that circles the neck. 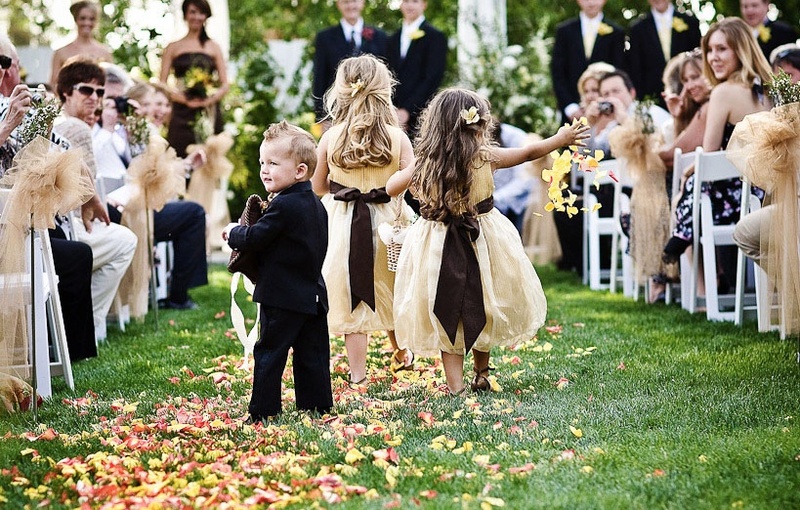 Children can be a wonderful part of a wedding ceremony, full of joy and spirit. It does take a little extra thought, planning and accommodation, however, to include them successfully. We’ve compiled a list of helpful tips and things to consider, to make your wedding celebration a kid-friendly event! Consider their ages. Young children are adorable, to be sure, but their behavior is unpredictable (to be sure), so if you do include them, be prepared for the unexpected. Imagine a three-year-old tugging on your dress during the heart of your wedding ceremony and asking in a loud, clear voice “are we done yet?” Does this fill you with dread, or make you warm and fuzzy? 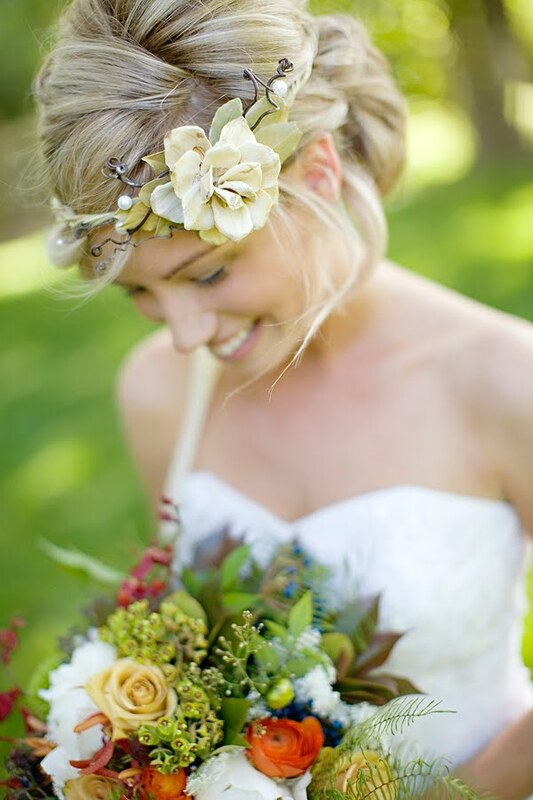 Do what feels most comfortable to you, taking into consideration your personalities, your families and your wedding style. Ask in person. For older children, ask them in person to be a part of your wedding (after running it by their parents first.) This makes them feel involved, important and honored. Spend time with them. Try to include them in pre-wedding events and activities, and just generally spending time with them before the wedding so that they feel connected and involved. Again, this is more important for older children, and is certainly dependent on their age, interest and hometown (whether they live near you or not.) The point here is simply to make sure they don’t just feel like a ‘prop’ in the wedding, but instead, a valued and important participant in this honored event. Rehearse! Be sure to include them in the rehearsal, so they feel more comfortable with what is going to happen, how and when. Even young kids will benefit, by making everything feel more comfortable and familiar. A special gift. Consider making or purchasing a special gift for them, to honor their participation. This will also help them remember this special event and their involvement. Gifts will vary widely by age; some ideas are in the article below. Keep parents close. For younger children, keep parents seated up front. It’s ideal if young children can walk down the aisle with someone (a parent, bridesmaid or groomsman), and then sit down immediately with their parents in front. It’s way too much to expect a young child to stand quietly up front during the whole ceremony! Oh goody, goody bags. Goody bags at the reception (or even during the ceremony, if they’re filled with non-messy, quiet items) for kids are a great way to keep them entertained for awhile. Babysitters, special kids’ meals, art supplies on a table in the corner, and videos playing in a corner or adjoining room – these are all good ideas if children will be participating in your Big Day. Need a nap? For young children, be sure to take their nap and bed times into consideration! Tired children are impossible, trust me on that. . . If your rehearsal or wedding will take place after their bedtime, or during their nap time, you may want to reconsider the extent of their involvement. Perhaps instead of walking down the aisle as a flower girl, they could dress up in a special outfit, and be carried by Mom or Dad, with a trusted babysitter nearby ready to take them home when necessary. A puzzling idea. 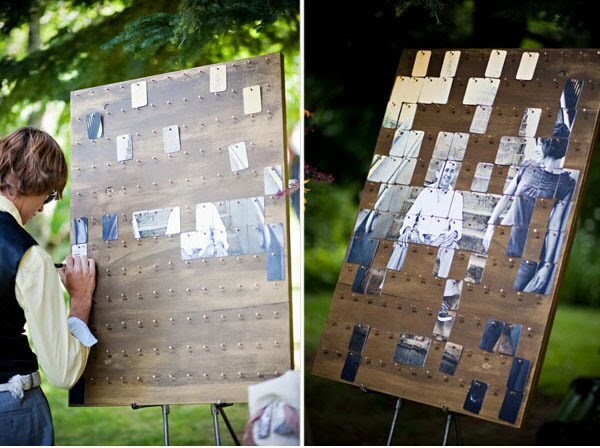 Here’s a very unusual idea: a photo of you and your fiancé is adhered to a wood backing and created into a puzzle. Your guests sign the back of each puzzle piece with a fine tip black marker. Learn more and see photos at MGC Puzzles web site – http://www.mgcpuzzles.com. Welcome to our gallery of table decor examples. 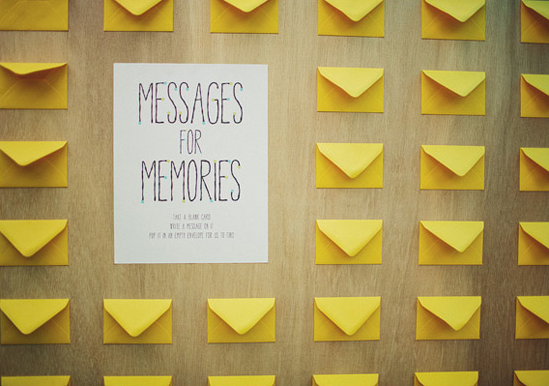 Sometimes a photo is all you need to help you select a theme, a color, or a detail that defines your wedding reception.